By next April, PMEs tangling with their employers on salary issues will have an affordable place to go to for recourse: the Employment Claims Tribunals (ECT). A law setting out the mandate of the new tribunals - which come under the State Courts - was passed in Parliament yesterday. First proposed in 2014, the ECT will cover workers at all salary levels. But it will benefit professionals, managers and executives (PMEs) earning over $4,500 a month in particular, as they would otherwise have to file claims with the civil courts. The current Labour Court does not cover them. Employers can also make claims for payments if employees terminate their contracts without notice. There is growing demand for an affordable and expeditious way to resolve salary-related disputes, Manpower Minister Lim Swee Say told Parliament. This is especially so for PMEs, who number 20 per cent more than they did a decade ago, he said. Together with technicians, the group now comprises over 54 per cent of the total resident workforce. 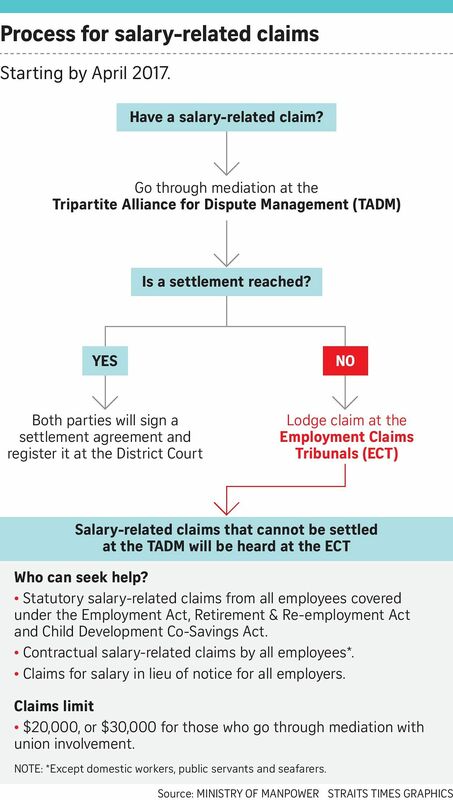 For now, 18 types of contractual employment claims such as bonuses, overtime payments and retrenchment benefits, as well as 43 statutory employment claims fall under the tribunals' jurisdiction. The claims limit for the ECT will be $20,000. But it goes up to $30,000 for cases that involve unions in mediation. A total of 12 MPs voiced support for the tribunals during the debate, with some asking for their remit to be widened. The ECT does not cover disputes such as unfair dismissal and workplace discrimination, said Mr Gan Thiam Poh (Ang Mo Kio GRC). Workers' Party (WP) Non-Constituency MP Dennis Tan and WP MP Faisal Manap (Aljunied GRC) asked that foreign domestic workers be included under the ECT, while Mr Louis Ng (Nee Soon GRC) called for more protection for foreign workers awaiting payments. Labour MP Zainal Sapari (Pasir Ris-Punggol GRC) and Mr Faisal asked that fees be waived for low-wage workers or those with financial difficulties. Mr Lim said this would be done in deserving cases as it is in line with the State Courts' existing practice. A short-term relief fund will also be set up to help local vulnerable workers where companies cannot pay up, said Mr Lim in response to a question by Mr Gan. The minister left open the possibility that the ECT's scope could be expanded in future, even as he said it is not meant to be "so comprehensive that it solves all problems" . It's not our intention to make ECT so comprehensive that it solves all problems because the ECT is meant to be a cheaper, better, faster way of resolving disputes. Cheaper - must be highly affordable. Better - because it must be able to help more and more employees, including those not covered by the Employment Act, to have access to the ECT. And lastly faster. We want the dispute to be resolved as quickly as possible. "The ECT is meant to be a cheaper, better, faster way of resolving disputes," he said, using a phrase coined in 2009 when he was labour chief. It must be highly affordable, able to help more employees, and be able to resolve disputes as quickly as possible, he said. Before claims can be heard at the ECT, all parties will have to go through mediation. Indicating that this seems the likely route for the majority of cases, Mr Lim noted that over 90 per cent of Labour Court claims were resolved during mediation. The request for mediation must be made within one year after the claim arises, or within six months if the employment relationship has ended. There will be no legal representation. Parliament yesterday also passed an amendment to the Industrial Relations Act, which will allow more union members to use the existing Tripartite Mediation Framework. It now covers PME union members earning less than $4,500 a month in non-unionised companies. The salary cap is removed and rank-and-file workers will be able to use the framework.